Believe Industry Cut to Length Line(CTL Line) incorporate latest control technology ensuring the highest level of consistency to meet the demands of today’s work place. we also have another coil process equipment, like slitting line, blank lines. BELI® lines are custom designed to specific individual needs, whether processing thin gauge surface sensitive aluminium alloys or hot rolled high tensile steel, Believe Industry has the solution. The coil car load the coils onto decoiler and unload the after-slitting coils from recoiler. Enrty coil car makes coil loading and unloading easy and safe. Hydraulic cylinder for coil car lifting and motor for coil car moving. Hydraulic decoiler ensures the smooth and fast production for the whole slitting line. We have two kinds of hydraulic decoilers. One is single mandrel decoiler which penetrates inside the coil. Another one is double-load decoiler, which hold the two sides of the coil. Single mandrel decoiler is used for slitting coil thickness less than 3mm, and double-load decoiler is for slitting coil thickness more than 3mm. Coil entry leading and shoveling device easily move the coil entry to coil entry crop shear. While the coil entry leading frame press down and lead the coil entry to shoveling board, shoveling board spans to reach the coil entry. This ensures the smoothly infeeding of the coil entry. When the whole line is in operation, this device returns to its original state. Down pinch roller supply power for feeding and transferring the material. Up pinch roller can be lifted to adjust the gap according to different material thickness. When the material go to the straightening rollers, it will go through first straightening. And then the material goes into the loop pit. In a slitting line, there are usually two loop pits. One lays before the slitting device. Another lays before tension station. In the high speed slitting line, the loop pit is a very important part. And store materials for smooth production for the whole line. At the entrance and exit of the pit, there are two bridge tables. The cantilevered design as a bridge spans the pit to aid in feed-up and pivots down into the pit during the slitting operation. Usually there are 2 pairs or 3pairs of side guiding rollers equipped in the guiding device. Roller side guides ensure that the material is positioned correctly when it enters the slitter. And the guide rollers can be adjusted according to different material thickness. After guiding, the material goes through second straightening. This precision straightening device makes the material achieve great flatness and smoothness. Further more driven by servo motor to highly improve the whole line speed and cutting accuracy. 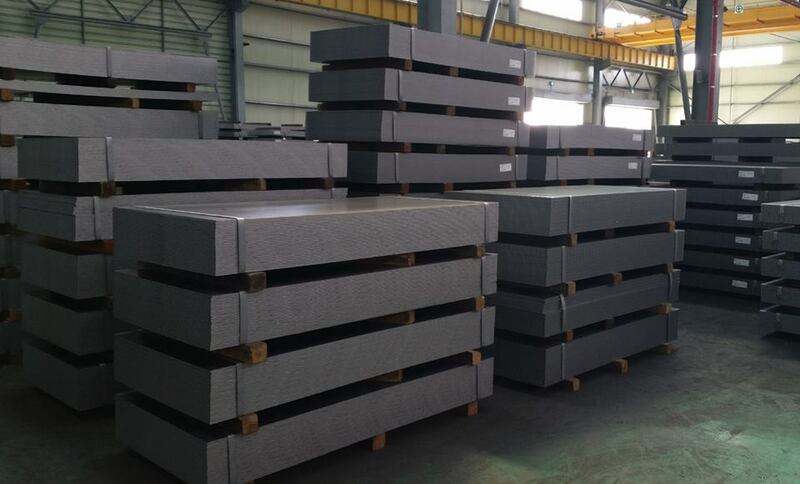 The convey belt convey the plate to the roller table, then the plate be dropped off and stacked neatly on the pallet car. Stacker cooperate with the pallet car, pallet car move over the lifting system to carry after-cutting plates. When stacking to a certain quantity, the car move out for packing, 2 cars work in turn.